The SOA subcommittee has been dissolved. The SPEC SOA Subcommittee, part of the SPEC Open Systems Group (OSG), is developing a new industry standard benchmark for measuring performance for typical middleware, database and hardware deployments of applications based on the Service Oriented Architecture (SOA). The objective of the SPEC SOA subcommittee is to develop a standard method for comparing performance of enterprise infrastructural components that provide Service Oriented Application (SOA) architectural concepts such as Enterprise Service Bus (ESB), Business Process Management (BPM), and Web Services. 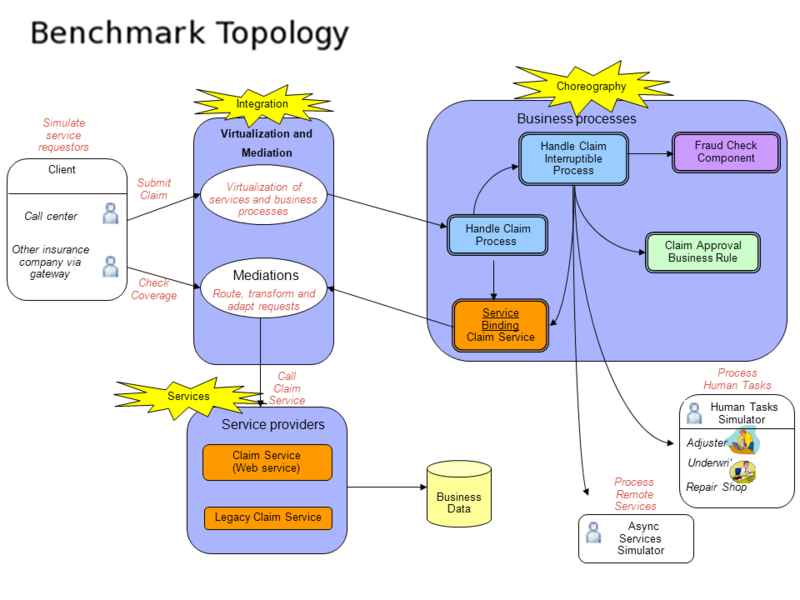 The subcommittee's first deliverable will be a benchmark that starts with an auto insurance claim process, using the basic concepts of Web Services, ESB, and Business Processes on top of infrastructural technologies such as application servers, ESB servers, Business Process servers, databases, operating systems and servers. See the adjacent diagram for details of the Benchmark Topology. The subcommittee intends to deliver a benchmark that has a primary performance metric for comparison across platforms. The primary performance metric will be based upon published component submetrics for services, ESB, and Business Process performance based upon the published workload mix. The benchmark will be designed to scale across a wide range of heterogeneous systems and technologies. The subcommittee was officially chartered in February 2010. Companies that have participated in the SPEC SOA Subcommittee include VMware, IBM, WSO2, Intel, Red Hat, and Oracle, as well as supporting contributing members Dr. Martin Kunz and Simon Haslam. The subcommittee, having developed the benchmark specification, is currently in the final stages of developing the Reference Implementation. SPEC welcomes organizations to join and participate in our work, please contact info@spec.org for additional information. The SPEC SOA subcommittee realizes that the technologies around which the initial benchmark is being built are not the only important technologies; different aspects of SOA that would introduce additional technologies are likely to be explored in the future.